A perfect spot to have a wine on the deck as the sun goes down - or if you are an early bird, watch the fantastic sun rise (pictured). Part of the charm of Dryden Bay is it's sandy beach and wonderful bird life. The property is boat access only. Water taxis take guests to the property from Picton on regular scheduled services - or you can hire a small water taxi from the Picton waterfront for a larger group or travel in by your own boat. A mooring is available as part of the rental. The house is a comfortable, well equipped, sunny home which offers an ideal retreat from hustle and bustle. The large deck gives the opportunity to dine outside, sunbathe or just chill. There is fantastic wild life all around the property and a lawn for children and adults to play on! The back lawn is fully fenced. There is a wharf to arrive and depart from and the property comes with a mooring should you bring your own boat. Great for families, small groups or a quiet weekend away. Dryden Bay is a Fishing paradise, located close to the scallop area and great dives spots.You do not have to leave the Bay for those that do not have boats as there is great fishing to be had in the Bay area - you do not have to travel far to catch a remember to pack your fishing rod and bait! Close to Ships Cove, the starting point for the Queen Charlotte Track. Excellent picnic areas and historical land sites are close by for a day out. Motuara Bird Sanctaury is a short boat ride and there are plenty of local walks available. If you feel like dinner out you could take the water taxi or your own boat to one of the local resorts nearby. The beach is flat and sandy, very safe for children and families. An easy launching spot for a dingy or kayak. The wharf provides a great place to fish with a hand line or to dive from. Everything is on your doorstep - the hardest part is deciding what to do next! A great place to have fun or just chill ..... you have the choice! No Smoking allowed in the property - outside only. Linen available at $30 per person if required. This is in a remote area of the beautiful Marlborough Sounds. The property is water access only which leads to much of the beauty of rich wild life and fishing in the area. You can often spot dolphins from the lounge or off the wharf at all times of the year and fishing is excellent even for the not so experienced. Altermate Chill Spot - BBQ on the deck and soak in the views and birdlife that surrounds you. Fantastic location and Bach, lots of things to do, and beautiful setting. Sue was fantastic help. We had such a great time! Dryden Bay was a great place for our stay in Queen Charlotte Sound. Dryden Bay was a great place for our stay in Queen Charlotte Sound. Close to local restaurants, and to Ship Cove and Motuara Island. The Jetty is really good to use as we had our own boat there, great non-slip steps and a good light on the jetty at night. The house was comfortable and well equipped, sunny and warm! Situated in a beautiful setting, we really enjoyed our stay, thank you. The property is ideally located for a Marlborough Sounds adventure including fishing, walking and relaxing. Our children highly enjoyed playing at the beach and kayaking in the bay. The view from the Bach is outstanding. The location is excellent and suited us. The location is excellent and suited us. The bach could do with a little tiding up drapes off hooks some need replaced and the lounge suites could be up dated not comfortable at all but the fire was great. We did enjoy the stay. Fantastic location loved the deck area. 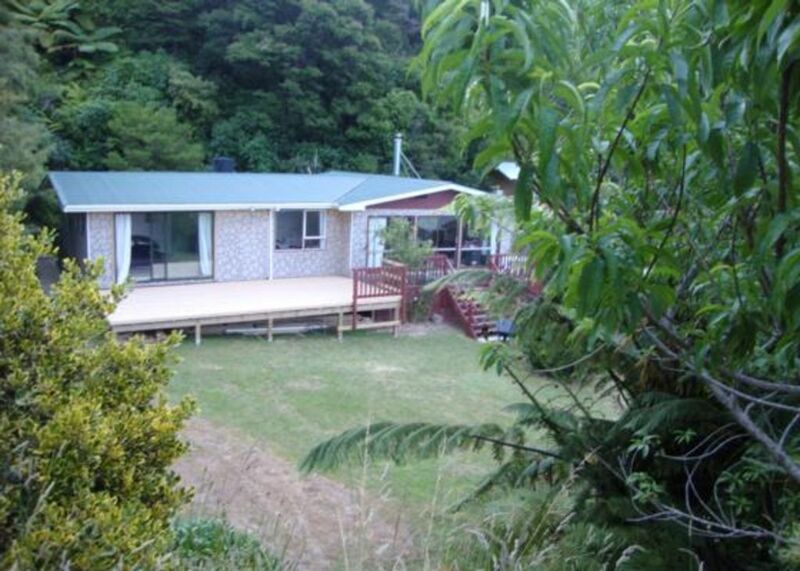 The property is in the beautiful Marlborough Sounds and is accessible by boat and water taxi only.